If you'd be so kind as to indulge me in one more consecutive veggie post, I promise we'll get back to the meat next week. Usually multiple vegetable recipes would be a difficult thing to pull off in my meat-centric diet, but as spring starts to settle in, I find I have a somewhat short-lived love affair with fresh vegetables as a response to the winter thaw. It's not just that I want some vegetables here and there, I want them all, and I want them now. 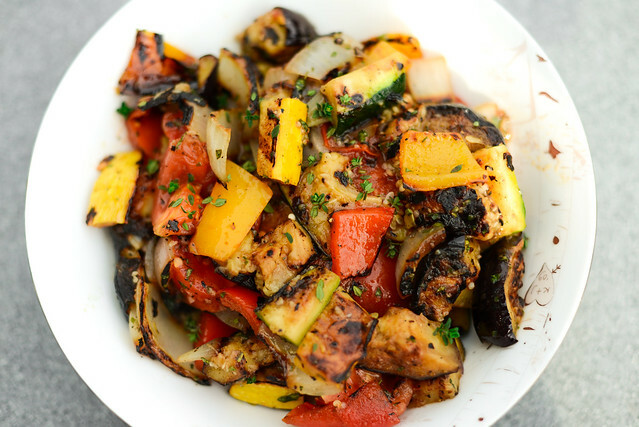 Making use of a lot of different veggies at once (well, one is fruit, if you want to get technical), this grilled ratatouille fulfills on those veggie cravings like nothing else.